Section 1: “Threshold 400″, focuses on the arrival of the Dominicans in the archipelago, to be named las islas filipinas, which was an auspicious event, particularly in light of the persons of those rare individuals, Domingo Salazar, O.P., who served as the first bishop of the colony, and Miguel de Benavides, O.P., the third bishop, and founder of the University of Santo Tomas. They came to sustain the spiritual fervor of the conquistadores; and to evangelize among the indigenous peoples and the migrants from the Middle Kingdom (now known as China). The very first books published from the period of first encounter will be on display for the first time in decades, together with such key documents as the oldest book of the UST Library, authentic copies of the Act of Foundation of the university, the Royal Cedula given by Philip IV in 1623, the Papal bulls, Royal decrees juxtaposed with period objects from the UST Museum. Section 2: “Realm of Print” displays a newly produced, never-before-seen exact replica of the first printing press, together with such rarities as the Librong Pag-aaralan nang Manga Tagalog nang Uicang Castila, the first printed book written in Tagalog and the first printed book by a Filipino printer, Tomas Pinpin. Who has not heard of Copernicus, Aristotle, Galileo, Strabon, Thomas Aquinas, Ceferino Gonzalez? See their master works on exhibit in “Spheres of Change,” the 3rd Section of Lumina Pandit which features ideas that traveled to the Philippines via new books, eventually leading to the Filipinos’ exposure to new ideas in the fields of law, medicine, agriculture, architecture, engineering, and theology. The earth is round, it was always so, but men did not realize it until the 16th century. In the exhibit’s Section 4, “Routes of Globalization”, Pigaffeta narrates the first circumnavigation voyage led by navigator Ferdinand Magellan. Nationalism in the Philippines was awakened through the arrival and death of Magellan. To familiarize us with tremendous advances in the history of humanity are books that tell this story: Relazione del Primo Viaggio, De Molucis Insulis, Ataque de Limahon, Historia Mundi, to name a few. The Philippines becomes independent from Spain and dependent on the United States of America. 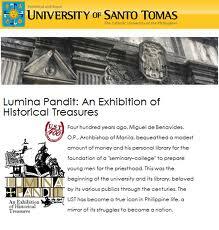 When the Americans created the University of the Philippines, UST was already 300 years old. What has UST done so far? See the journals of the time, religious and secular books, a listing of the different heroes, and many other artifacts. Take this unique opportunity to view the academic grades of the fathers of our nation, of four Presidents, six Supreme Court Justices and many other outstanding UST alumni. Lumina Pandit is derived from the Latin “lumina” (light) and “pandere” (to spread).